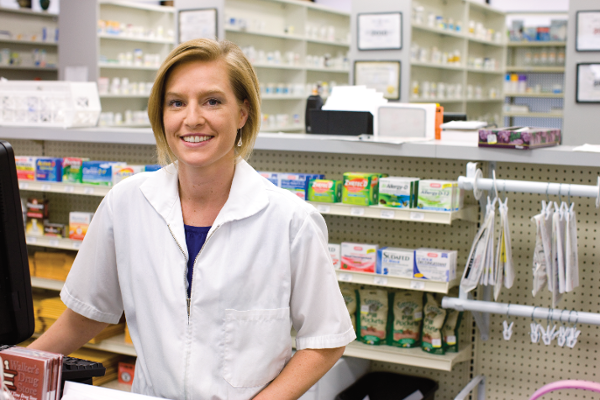 Across the United States, pharmacies are recognized as a vital part of communities and pharmacists are consistently ranked as some of the most trusted, honest and approachable members of the healthcare team. Patients have significantly more interactions with their community pharmacists than any other healthcare provider, approximately 35 times per year versus just four times with their primary care physician. These interactions can be the beginning of further understanding a patient’s overall health, allowing faster recognition and referral of treatment. It is quite evident that a pharmacist can improve patient outcomes by providing clinical services from behind the pharmacy counter, but what happens when we think outside the box and take the next step in the progression of the profession? The pharmacist steps out from behind the counter and makes an even bigger impact on patient outcomes. Recently, because of the readily available pharmacist, changes in legislation and regulation are allowing pharmacists to provide additional clinical services that were previously only done when the patient visited their physician’s office or clinic. African Americans see healthcare providers less often, have higher levels of mistrust in the healthcare system, increased rates of hypertension and greater rates of death due to hypertension than any other minority group in the United States. Barbershops are often known as one of many frequently visited social centers in the African American community and barbers are viewed as trusted members of society. In this study, organizers in Los Angeles expanded on this idea and decided to place pharmacists in barbershops across the city. Over a six-month period, these pharmacists conducted counseling and adherence sessions, provided education on blood pressure and blood pressure medications, measured blood pressure levels and adjusted medication regimens for the barbershop’s clientele. The results of the study were astounding; the presence of a pharmacist in the intervention group resulted in marked improvement in reduction of blood pressure levels and an increase in patient-reported well-being. Also, the access to a pharmacist in the clientele’s preferred environment helped increase the level of trust in a healthcare profession that may sometimes be lost in these communities. This same concept of providing pharmacist access in frequented social centers can be extended to other groups in a community setting. Pharmacists could essentially attend church functions, town hall meetings or game nights: the opportunities are endless. Adult vaccination rates remain low and continue to be a public health problem for our nation. New data is showing that with the implementation of pharmacist-administered vaccines, vaccine coverage has vastly expanded. One study even showed that flu shots administered by pharmacists in 2013 may have prevented at least 80,000 additional flu cases. Pharmacist administration of vaccines has grown from a mere concept to now, where pharmacists are not only widely accepted as vaccine experts and immunizations have become part of their standard of care. Patients can walk into their local pharmacy to receive the flu shot and other vaccines--no appointment required. In stepping outside the traditional pharmacy box, pharmacist involvement with vaccines has aided in disease prevention and improved public health and awareness. Healthcare costs, specifically due to hospital reimbursement rates, are at an all-time high. Also, employers are experiencing an increase in employee healthcare expenditures because of overuse of sick days and loss of productivity due to worsening of chronic disease states. Thus, researchers at the University of North Carolina created the Asheville Project, the first of its kind: a patient-centered, payer-driven project connecting community pharmacists with patients. The goal of the project was to ensure city employees with chronic conditions (including diabetes and high cholesterol) understood their medications, used them correctly, and experienced improved outcomes. City employees received extensive education and counseling about their disease states, routine physical assessments of skin, blood pressure, weight, neuropathy and cholesterol management, all by a pharmacist practicing outside of their normal box. At the end of the five-year project, patients reported improvement in health outcomes (lower A1c and LDL), lower healthcare costs, a reduction in sick time and improved satisfaction with their pharmacist-administered services. This model can be extended to cover other similar employer-funded healthcare initiatives, including disease state management of asthma and hypertension, or this model can be used in a community clinic setting with AIDS, geriatric medicine, psychiatry, etc. Pharmacist intervention in these settings not only impacts outcomes but can also improve community perception of the role of a pharmacist since services are outside what the public may consider the typical pharmacy box. The concept of a telepharmacy is the same as a traditional pharmacy in that none of the roles or scopes of practice have changed. The main difference is that the pharmacist performs tasks remotely through audio and video technology. The pharmacist expands their knowledge outside of their current box, allowing them to perform their duties from a different location and access rural or urban medically underserved locations which previously had no pharmacist access before (Read our article on underserved areas here). Federally qualified health clinics (FQHCs) and clinics located in urban and rural communities are primed for this novel idea. Many of these patients have transportation or mobility issues, often walking in inclement weather or taking one or two buses just to get to their appointments. After their FQHC or clinic visit, the patient then needs to again walk or take one or two more buses just to pick up their prescriptions. Telepharmacy allows a pharmacist to now provide pharmacy services in this underserved area, improving patient outcomes. Telepharmacy is unique because it allows access to a pharmacist in areas once considered not economically feasible. Everyone wins: patients have access to convenient pharmacy services through an addition of a telepharmacy at their point of care, pharmacists are able to leave the box and provide more clinical services and clinics can save money by expanding their resources elsewhere. Pharmacists are widely known as the most easily accessible healthcare provider and are uniquely positioned to provide patients with additional healthcare services, not just inside the pharmacy box, but outside in the community as well. By improving this accessibility, the pharmacist can help to reduce the number of readmissions through better education and communication with each patient interaction.